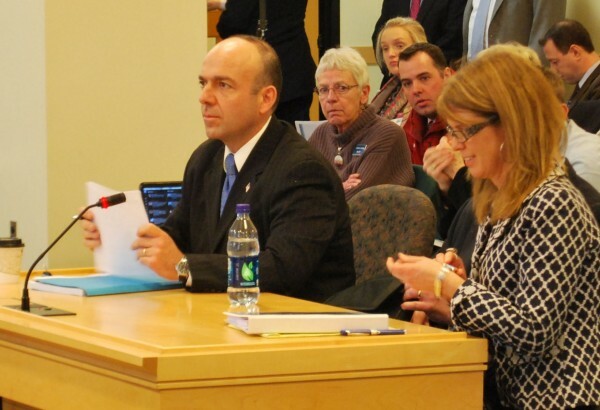 Rhode Island welfare consultant Gary Alexander (left) and Maine Department of Health and Human Services Commissioner Mary Mayhew prepare Jan. 14 to answer questions from the Health and Human Services Committee at the Cross Office Building in Augusta. What is 130 pages long, costs Maine taxpayers $108,000, offers them a plethora of policy judgments they didn’t need or ask for, is woefully incomplete and will prove of no help at all in settling an important state policy debate? That would be the Medicaid expansion feasibility study assembled by Gary Alexander and his firm, the Alexander Group, at the request of Gov. Paul LePage’s administration and delivered last week to the Maine Legislature. As we’ve stated already, the Alexander Group delivered to LePage a political document disguised as impartial analysis created at taxpayers’ expense. What’s even more disappointing is that Maine could really benefit from an impartial and complete analysis of Medicaid expansion that addresses not only the policy’s costs but also the benefits. Alexander and his team fell well short of delivering this needed service. The team calculated only the cost of expansion — in a methodologically suspect way that inflated the final number — without considering any effects, either direct or indirect, that offset the cost. The Maine Department of Health and Human Services should inform its contractor that he and his team delivered an incomplete product and instruct him to finish the job. In examining the costs and benefits of Medicaid expansion in Maine, the Alexander Group had examples to follow from numerous states that either performed or commissioned comprehensive assessments of the impact of extending coverage to more low-income adults. In Ohio — where Republican Gov. John Kasich ultimately expanded Medicaid — such an analysis sought to answer questions about new costs, potential expansion-related state budget savings, expansion’s effect on state revenues, the net state budget effect, economic and health effects on Ohio residents, and Affordable Care Act-related effects Ohio would face even if it didn’t expand coverage. Alexander’s report neglected to even address half of those questions for Maine. The cost of the foundation-funded Ohio report was $113,500, according to the Health Policy Institute of Ohio, which led the initiative. And the analysis involved experts from multiple organizations — including Ohio State University, the Urban Institute and Regional Economic Models Inc. — because no single organization had the expertise to properly answer all questions. The Alexander Group, if it didn’t have the appropriate expertise, could have commissioned qualified firms to assess effects on the economy, health, state revenue and more. The $113,500 cost of the Ohio analysis is a comparable cost to that of the Alexander report, but Maine got nothing resembling a comparable result. Even on the side of the issue the Alexander Group did examine, the analysts drew conclusions grounded in ideology rather than analysis. For example, the Alexander Group argued that expanding Medicaid would impose an excessive administrative burden on the Maine Department of Health and Human Services. But the analysts neglected to note that, with or without expansion, the Affordable Care Act already requires major administrative changes in the way states determine Medicaid eligibility. Adding a new population would be far from the primary administrative concern. And much of the Alexander Group’s argument against signing up for expansion hinges on what the group characterizes as a probability that the federal government will one day reduce states’ Medicaid funding rates. That would leave states covering a larger portion of their Medicaid costs. “There’s nowhere for the federal government to go but down,” Alexander said. No one can predict the future, but there’s no historical precedent for such a move. Since Medicaid began in the 1960s, the formula for determining match rates hasn’t changed, and expansions of the program, such as the Children’s Health Insurance Program and today’s Affordable Care Act expansion, have garnered permanently higher match rates. Congress even temporarily raised match rates during the last recession. That’s not to say Medicaid has never sustained cuts. It has, but the changes haven’t affected funding rates. Governors have demanded the cuts be made elsewhere. The 2005 Deficit Reduction Act, for example, changed the way Medicaid paid for prescription drugs, allowed states to offer scaled-back coverage plans for some recipients and tightened up rules for applicants for long-term care services. What would a complete Medicaid expansion analysis have revealed? The findings certainly wouldn’t fit neatly into the ideologies of Alexander or LePage. And that’s probably why LePage’s Department of Health and Human Services is unlikely to request a do-over.